Hi, I am interested in your 1962 Chevrolet Impala (stock #4696-CHA) listed on Autotrader for $42,995. I'd like to get more information about this vehicle and confirm its availability. 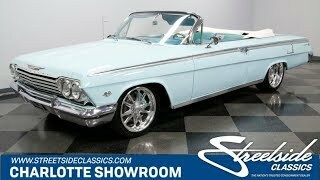 The 1962 Chevrolet Impala SS convertibles are legendary for being cool, comfortable, and powerful. This one has all the right features of an icon with a few key upgrades like four-wheel disc brakes to deliver an experience better than your nostalgia. Nassau Blue is a terrific original color to have on this convertible. After all, the name alone reminds you of a tropical sunny day. Thats why you can tell they invested a proper respray of this factory-correct color, so now it has a terrific clear coat shine. Plus, the white convertible top looks like the crest of an ocean wave. Of course, all that glittering chrome adds to the bright appeal. But theres more to this classics attractiveness. It has the premium performance look that we love on an Impala Super Sport. It includes hallmark six taillight arrangement, full badging, and the full-length machined trim panel that has an arrow-like quality prodding this convertible forward. Adding to this sporty appeal is an upgraded to Budnik GTX wheels that are staggered 18/19-inches front/rear for an aggressive stance. With the touch of a button, the convertible top powers down to reveal the correct aqua interior. So this was delivered right from the factory with all the visual appeal of a deep blue ocean. The detail work on this is terrific with the button-top presentation on the door panels, and the silver piping on the seats that coordinates with the bright work trim. It has all the right Super Sport touches, including the bucket seats, locking center console, and bright rear speaker grille. Plus, there are nice upgrades like an AM/FM/CD stereo and provisions for modern R134a air conditioning. While theres plenty of room for family and friends, the driver is the true king with the upgraded steering wheel, chrome tilt column, and auxiliary gauge trio. The 327 cubic-inch V8 is now an icon in the small block Chevy circles, and that legend began in 1962. In fact, this is a year-correct motor thats believed to be original to the car. But one look at the engine bay, and you know there has been some modern investment, too. It has plenty of extra shine from the valve covers, air topper, alternator, and much more. The V8 inhales through a four-barrel carburetor and performance intake, and it exhales through a rumbling Flowmaster dual exhaust. This sound can be enjoyed for as long as you want because this Impala is configured to be a cruising machine with power steering and a Powerglide automatic transmission. Plus, it has the superior stopping power of Baer four-wheel disc brakes (the calipers were even painted to match the exterior.) Plus, there have other upgrades like a Global West adjustable Panhard bar and the modern grip of Cooper Zeon tires. So this one handles better than just about any other classic Impala youll find. The sale comes with the owners manual, car cover, and plenty of original equipment that was replaced. Its a cool classic that has received all the right investments for show and go. So dont miss out on your turn-key dream cruiser. Call now!